Over 650 disabled military veterans, including some from Great Britain and Puerto Rico, are expected to compete in 21 events. The National Veterans Wheelchair Games rolled into Orlando this week, bringing events ranging from wheelchair rugby to archery and table tennis. The 38th games kicked off at the Orange County Convention Center on Monday with events happening through Saturday. Admission is free except for paid convention center parking. Josh Burch, a Marine veteran from Virginia, is in his first year of playing wheelchair rugby. 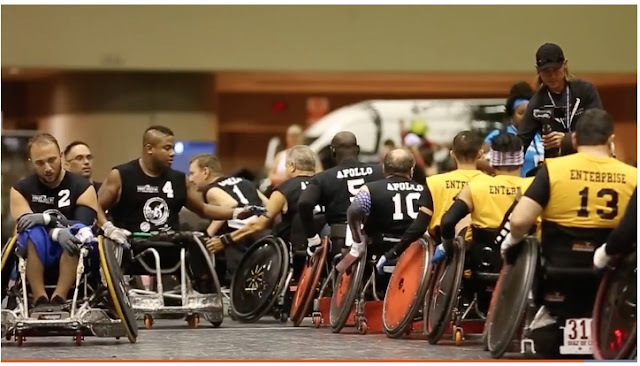 Wheelchair rugby isn’t exactly like the rugby other athletes play, he explained. For the games, he’s on a team with Mason Symons, an Army veteran from Texas who has dreams of making it to the USA team. He said things can get heated sometimes.